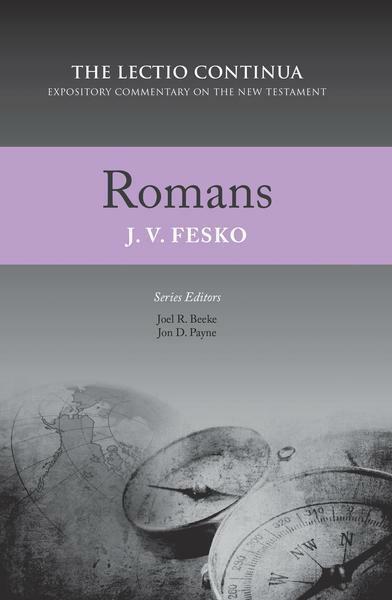 Romans, by J. V. Fesko. Reformation Heritage, 2018. Hardcover, 464 pages, $24.00. Reviewed by Reformed Theological Seminary professor Ben C. Dunson. For those whose own theological perspective is Reformed there are few surprises in Fesko’s reading of Romans. What perhaps distinguishes this commentary most is its welcome concern to apply the text to the heart as well as the mind, seen, for example, in Fesko’s treatment of hypocrisy and pride in Romans 2:17–29 and his discussion of hardship and suffering in the life of the believer in Romans 8:18–25. It may be most helpful to interested readers to note a few areas where Fesko takes a view that is contested by modern interpreters. Fesko straightforwardly expounds Paul’s prohibition against homosexual desire and activity in Romans 1:26–27. With regard to Paul’s teaching that God “will render to each one according to his deeds” (Rom. 2:6) and that “the doers of the law will be justified” (Rom. 2:13), Fesko takes the position that such statements hypothetically lay out the law of God to send lawbreakers to Christ (47–52). In chapters 9 and 10 (on Rom. 3:21–31 and 4:1–8), and throughout the commentary, Fesko clearly articulates Paul’s teaching that Christ’s death accomplishes a penal (judicial) substitutionary atonement for his people that turns God’s righteous wrath away from them. Justification is thus a forensic (legal) declaration that one is in the right with God, a verdict grounded solely in the imputed righteousness of Christ. Fesko elsewhere emphasizes that the strength to pursue progressive sanctification lies in the fact that the believer is a participant in the new creation, and that the Holy Spirit is actively at work subduing the sinful flesh of the believer. On the identity of the “I” in Romans 7:13–25, Fesko, in agreement with an increasing number of Reformed scholars, contends that Paul is not writing about himself (before or after conversion), but about “Israel’s collective experience under the law” (182). In sum, Fesko has written a straightforwardly Reformed commentary that is focused on the meaning of the text as well as its application to the hearts and lives of believers. Pastors and laypeople will benefit from his exposition.